If you have been with me a long time, you are aware of my ups and downs with weight. It has been my biggest struggle since I turned forty. This post is not about seeking advice to get on the losing track once again, it is a post about acceptance where you are. We can discuss healthy eating another day. I am a stress eater and in a career surrounded by food…. I am determined there will be a day I conquer the beast. But, for now….As I said, I go up and I go down, and I hover around a certain size…some days it does steal my joy …when I allow it to. But, most days I make a choice to dress the body I have to be fierce, strong, confident, intelligent and fun. Life is too short to sit in a corner and cry over my weight gain….again. Today’s world of fashion is definitely bringing better choices for the plus size woman than ever before. I have favorite brands because of their options for a variety of women from peitite to tall to plus size. And, I love the fact that on Project Runway Season 16, they are designing for women of all sizes up to Size 22. This outfit makes a statement to be visible no matter my size. I can enter a room wearing a statment pant like this with a smile on my face and still feel like I look my best. Am I working on achieving a healthier weight?…you bet. But, for now, I still want to look and feel great when I leave the house in the morning. That keeps me optimistic and joyful. This entire outfit…pants, top, necklace, and bracelet…are all past Chicos purchases. 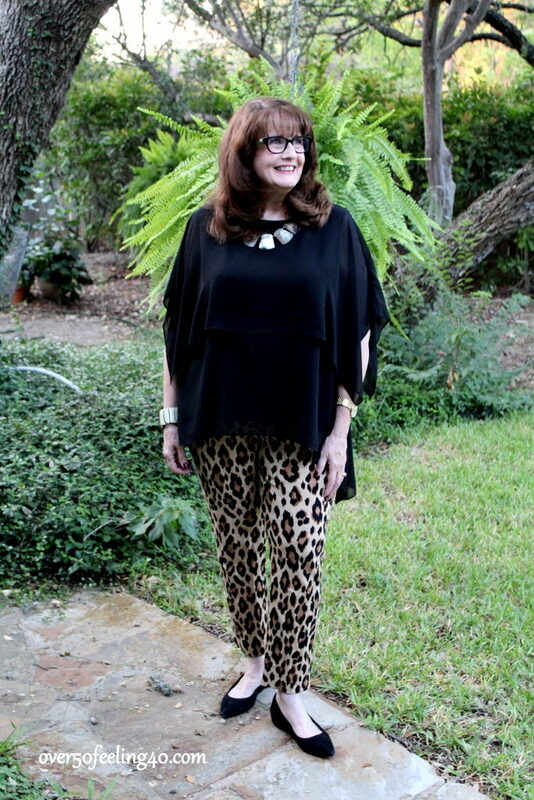 I love the comfort and fit of the Juliete Pant at Chicos, and I selected some fun options for you below. 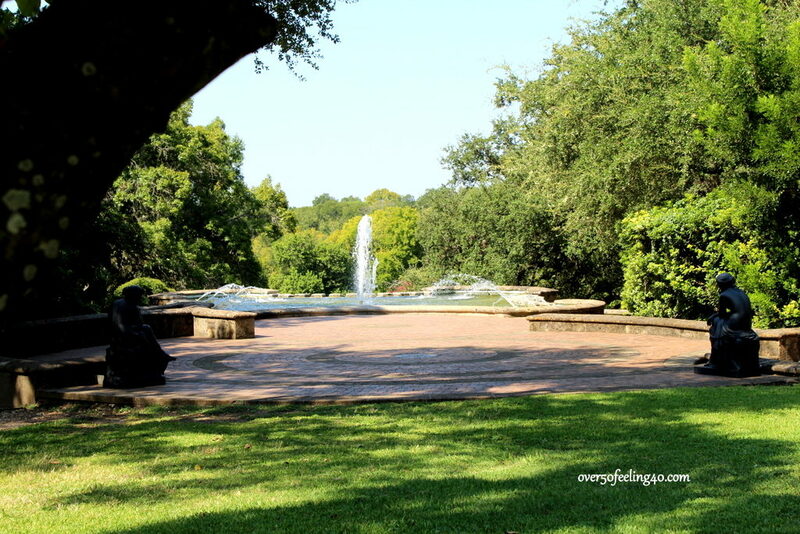 I wore this look for a morning at the McNay Art Institute in San Antonio. Tuesday, I will show you what a few other stylish ladies over 50 wore to the same event. It is important to have clothing which helps you to feel confident about YOU, no matter your size or age. Don’t think you can’t hit the sweet spot…you bet you can, girls! This is a great outfit for a confident interesting woman of any size. I wish you success on your efforts at healthy eating and exercise. Thank you so much…I do feel fierce when I wear this. And it is so comfortable. Once again Pam, thank you for being real and honest. I think for many of us, we get down in the dumps when some pounds creep up and allow it to rob us of the joy in right now. We may put off buying until we get to our preferred size. I like your approach a lot better. Not only is it healthy, it is realistic. I love those shoes. 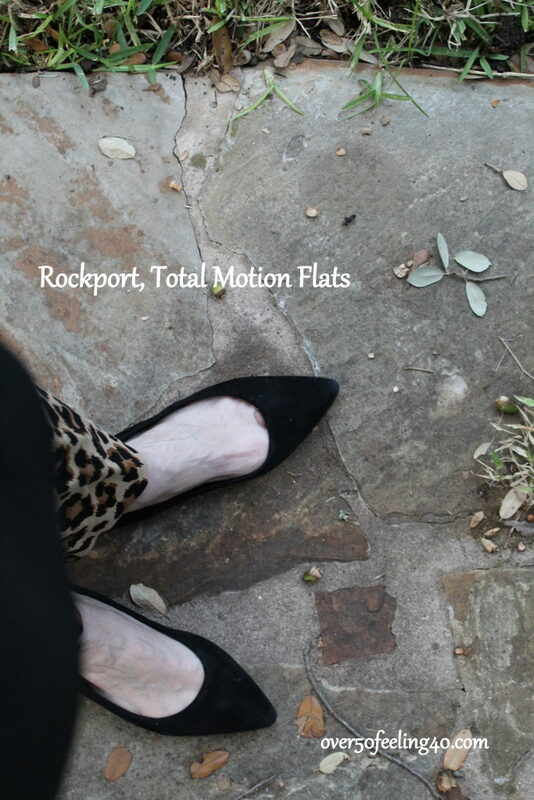 I have been trying to consider flats and lower heels (and they seem to be trending), and yours are perfect! Thank you, Karen. I have to be honest with myself and with the audience. I know ther are others who struggle in these areas and the path to turning things around is to looking your best each day and not allowing it to rob joy. I do believe that every day I get a little closer to conquering it for healthy reasons! Your honesty is so refreshing in this “virtual world” of white washed lives and size 2 bliss! I’m up 10 pounds in the last year and needing to dress differently to feel confident. I don’t want to wallow in my ups and downs. I want to enjoy each moment no matter where I am on the scales. Though I would like to be smaller for health reasons, I am not going to hold off looking my best waiting for this magic number on the scales. Thanks for your honesty as well, Jennifer! It hasn’t been easy for me to face the fact that I have gone up a size — especially when I really wanted to go down one! Your post today makes me feel a whole lot better and not be too hard on myself. I’m still working on doing better, but in the meantime I will continue to be confident and happy with who I am today!! Good for you. I know how hard it is to fight those mental demons of self loathing at times. But, while working through it, remember you are unique and one of a kind…rock who you are today!! Thank you, thank you. Stress is underestimated as a cause of weight gain for post-menopausal women, IMO.Some of us have huge amounts of stress at this stage of life, as caregivers for elderly parents. It can be overwhelming. We need kindness and compassion for ourselves. We need to feel good. Accepting ourselves and finding the right clothing at our current size is a good thing. Look good, feel great. Well said…and thank you so much for sharing. I have so many friends dealing with the same type of stress. So true about stress!!! I am dealing with this one (elderly mom) plus sudden job stress. It’s not good, and yes, much overlooked as a cause of weight gain! When I stress eat, the pounds are on me before I realize it, because I am thinking of all the things I am stressed about and not about the food. I have to change that! Thanks for the comment, Karen. Thanks for adding another voice, Patricia. I would hope you also can be content with where you are right now. There are ways to add a youthful touch to our style…and I bet you are looking good! We are always our worst critic. My weight too goes up and down and I’m a plus size woman. I’ve found that when my weight is up, I can still enjoy fashion by putting my budget toward shoes and accessories. I have some simple knits from JJill that still fit even if I have gained or lost a whole size. By building my look through accessories, I can avoid buying a lot of clothes I hope will be too big soon. I have over fifty scarves, and look on line often for new ways to wear and tie them. Hi Linda, I also love accessories and I make sure I have good structured pieces in my wardrobe which are slimming. A great fit in a jacket will take off the appearance of 10 pounds…like magic. I also love scarves…we are on the same page there! Thanks for stopping by. You are so sweet, Patti. I wish it was just a number…the doctor says different. I know I need to get a handle on this for health reasons more than anything. But you kind words are so welcome! You look great! I couldn’t agree more about your outlook although I still need a pep talk once in a while. Thanks! We all need that pep talk occasionally, Janet. Thanks so much! This is such a great look. I love any animal print. You look fantastic. Thank you, Victoria. How kind! You are so cute! I love how you style your outfits. 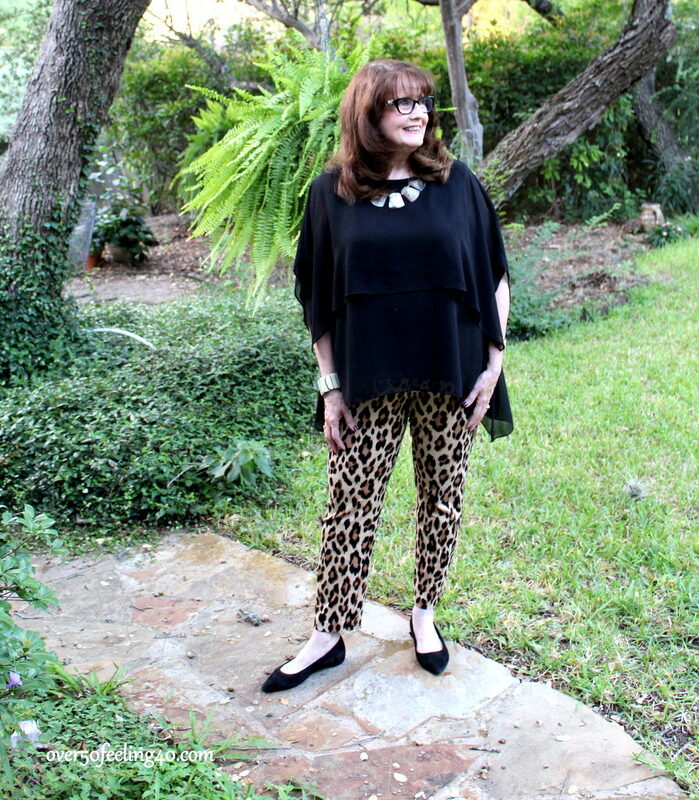 I know many ‘larger’ women who would never do the leopard pant! Why not? I do believe it’s about confidence. Sometimes we have to move out of our comfort zone to find our confidence. About weight, it’s a battle we all face post menopause. Yes, our doctors tell us to lose pounds for health reasons and aren’t we bombarded by messages from the media!? Sometimes the stress from all this can be too much and I few that does more damage than the extra weight. Good luck, glad I found your sight it offers so much interesting information. Thank you for all the encouragement, Allison. I am so happy to have you join us! Have a great weekend. Hi Melissa…I feel every one of your words. I have been up and down and up and down for years and probably need a thyroid check. Just remember…don’t let this rob you have your joy. Life is just too short. Dress the body you have today using tips to slim your look. Then embrace who you are today…it really helps you to lose the weight when you are optimistic and hopeful. When we get shut down, we just put on more and more and communicate we don’t care with out looks. I highly encourage you to be exercising..it really does make such a difference in every thing. I did not walk into a gym until I was 60 years old, but I am so glad I did. Let me know how it’s going and please know I am fighting this battle right alongside of you. Thanks for sharing.